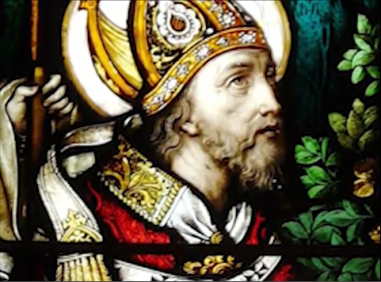 Summary: St Malachy, Bishop Malachy was born near Armagh in 1094 . He became vicar of Ceallach, the reforming bishop of Armagh, and he continued this work of reform as bishop of Connor and as abbot and, later, bishop of Armagh. He introduced the Cistercians and the Canons Regular into Ireland. Returning to Ireland from a visit to Rome in 1148 he revisited Clairvaux, where he caught fever and died in the arms of Bernard on 1/2 November. Both are buried together. 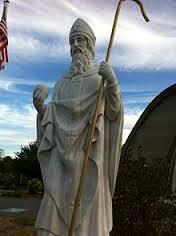 St Malachy is the patron of the dioceses of Down & Connor. As well as being a committed monk, Malachy struggled heroically to wrest control of the Church from lay dynasties and give bishops effective authority in their dioceses in 12th century Ireland. Patrick Duffy tells his story. Malachy was born in 1094 the son of Mogrón Ua Morgair, who was the chief lector and fear léighinn of the church of Armagh. His Irish name Maol M’Aedhóg means “the servant of Mogue”. Since Mogue, or Aidan, was an Irish saint from Connacht who became active in the south-east and patron of Ferns diocese, this naming shows his parents had an interest in Irish church tradition beyond the local. His father died at the monastery of Mungret near Limerick, when Malachy was eight. Around this time in Ireland the main church centres were ruled by lay abbots (coarba)who claimed their position by succession in their extended family. Such a coarba or lay abbot would usually but not always have a bishop to perform liturgical functions, but the real power was with the coarba. A start was made to reform this lay control at the 1st Synod of Cashel in 1101. In Armagh this system of dynastic succession had gone on for many centuries, and it was by this process that in 1091 Ceallach succeeded as abbot of Armagh and coarba of Patrick. But in 1105 Ceallach presented himself for ordination to the priesthood and the following year, while visiting Munster, was consecrated bishop by Maol Muire Ua Dúnáin, Bishop of Meath and papal legate to Ireland. Malachy had his first schooling in Armagh. When he was about twenty he decided to became a monk under the abbot Imar and after five years was ordained priest in 1119. Ceallach was absent at first in Munster and then in Dublin following the death of Bishop Samuel Ó h-Ainglí of Dublin and before the installation of the new Bishop Gregory. During this time Malachy acted as vicar in Armagh. Even then he was noted for promoting reform, especially with regard to Mass and the chanting of the hours as well as the other sacraments. On Ceallach’s return, Malachy went to Lismore for further training as a monk under Bishop Malchus, who previously had been a Benedictine monk at Winchester. On his return to the north, Malachy set about rebuilding the monastery at Bangor and was consecrated bishop of Connor. Again he supported reforms, but after three years war broke out and forced him to go again to Lismore. From here he founded a new monastery – Ibracanse – possibly not too far from Cashel. Ceallach died in 1129 nominating Malachy as his successor, but the tradition of dynastic succession was not so easily set aside. Muircheartach, son of Domhnall, a layman, was installed as abbot and coarba of Patrick; he held the symbols of the office – the crozier (bacall Íosa) and the Book of Armagh. Malachy, supported by Bishops Malchus of Lismore and Gilbert of Limerick, put forward his claim. He was able to administer part of the diocese while living outside the town and not claiming the revenues. In 1134 Muircheartach died and was succeeded by Niall, but three years later there was a change of coarbs. Malachy resigned as archbishop and was able to have Gille Mac Liag, up till then abbot of Derry, installed and accepted by all as coarb and archbishop for the next forty years. Malachy returned to Bangor and consecrated a bishop for Connor, keeping Down for himself. All this entailed much struggle and hardship. Malachy was helped by the neighbouring King of Airghialla (Oriel), Donchadh Ua Cearbhaill, and by the fact that Malachy’s own brother, Christian, was bishop of Arghialla (Clochar). Part of the price Malachy paid for the support of the King of Airghialla was that during this time the part of Armagh diocese that is in Co Louth was moved to the diocese of Airghialla/Clochar. In 1139-40 Malachy travelled to Rome via Scotland and the Cistercian monastery of Clairvaux, where he met and befriended St Bernard. Malachy left some followers here to be trained as Cistercians and this resulted in setting up in 1145 of the Cistercian abbey of Mellifont in Ireland. 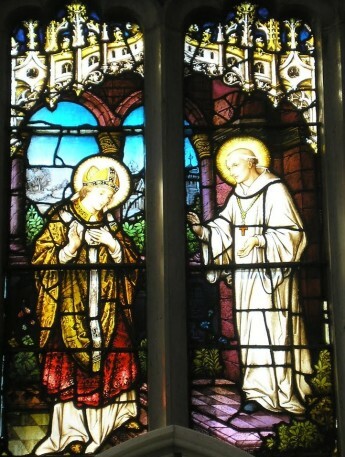 At Rome Malachy pressed Pope Innocent II for two pallia for the archbishoprics of Cashel and Armagh. Although he did not receive the pallia, Pope Innocent appointed him as papal legate and on his return he organised the Synod of Inis Phádraig, an island off Skerries, to make formal application to Rome for the pallia. Eventually four pallia were given, but Malachy did not live to receive his. Setting off in the hope of meeting the new Cistercian pope, Eugene III, in France, Malachy died in the arms of St Bernard at Clairvaux on the night of the 1-2 November 1148. Bernard wrote his Life and from this his cult spread especially among the Cistercians. In 1190 Pope Clement named him among the Cistercian saints. Malachy was the foremost of several reforming bishops in 12th century Ireland. He was also responsible for introducing the first Cistercian monastery at Mellifont and the first Augustinian community at St Mary’s Abbey in Louth to Ireland. Malachy did not leave any writings. The so-called Prophecies of St Malachy, which purport to predict through the form of riddles or symbolic titles all the popes to the end of the world, are a forgery of the late 16th century, using the name of Malachy in an effort to gain credibility.